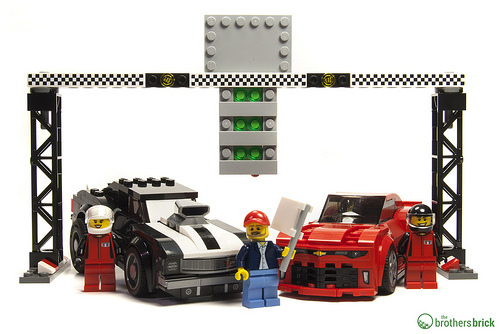 If the 2016 Ford Mustang that I reviewed introduces American muscle to LEGO’s Speed Champions party, then 75874 Chevrolet Camaro Drag Race turns the music up and gets things rolling. It features a 1969 Camaro facing off against its 2016 counterpart for a drag race. 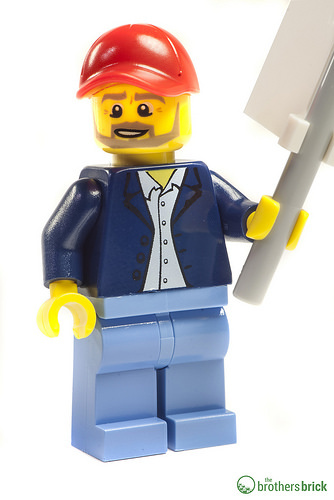 The set has 445 pieces including three minifigs, and will be available in March for $29.99 USD. Thanks to LEGO for sending us this copy for an early review. 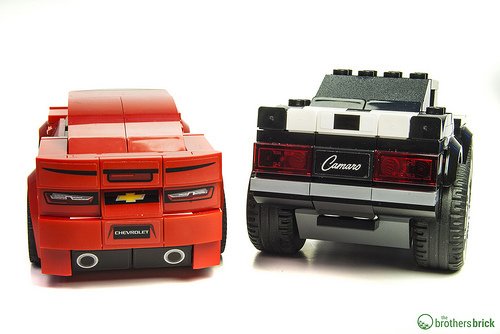 Like the other boxes in the Speed Champions line, the company’s logo—in this case the Chevy bowtie—is prominently displayed on the front. The back shows the play features and vehicles, as well as images of each of the real-world cars: an orange with black stripes 1969 Camaro, and a red 2016 Camaro. I wonder why they couldn’t source a photo of a black classic Camaro, so it would match what’s in the box. And speaking of what’s in the box, you’ll get three large numbered bags, two instruction manuals, and a hefty sheet of stickers. The instructions begin with the shiny red new Camaro. If you’ve built any of the other Speed Champions cars, you’ll be familiar with the drill: an 8-stud-long chassis plate, with plates protruding to each of the bumpers. Add some studs-facing-out brackets for the rear bumper and door panels, big fender pieces, and some slopes over top of the whole thing, and call it a day. Of particular interest here though, are the 2×2 wedge plates that form the grille. We’ve spotted them already on the new Ghostbuster’s Ecto 1&2 set, but now you’ll be able to get your hands on them before that. You’ll find th ree pairs in black and one pair in red. 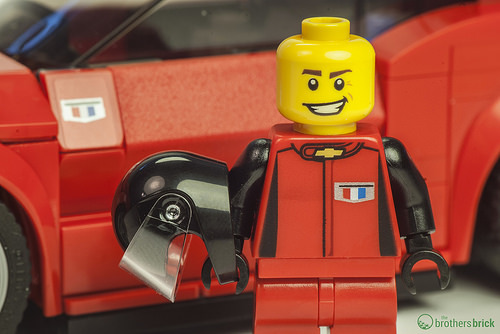 As with many of the Speed Champions line, the car’s face just doesn’t work without stickers. All of the headlights and badging are stickers. I’m not a fan of stickers, but I opted to apply most of them in set so that readers could see what the cars are supposed to look like. I did decline to place the sticker which creates the rear window, since it sticks across two pieces. The car’s rump consists of a whopping nine stickers for the taillights, license plate, and exhausts, all of which I did apply. The final effect is pleasingly Camaro-esque. 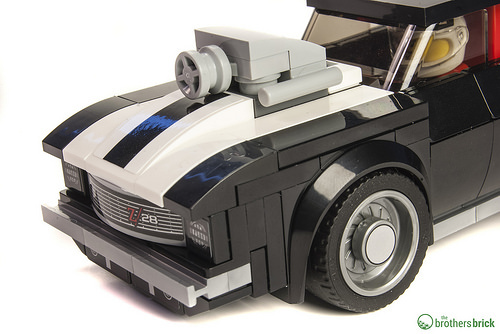 The similitude isn’t quite as striking as on some of the other Speed Champions (like the Mustang) but it’s obvious enough what car this meant to be. The 2016 Camaro is steered by a black-helmeted male driver. 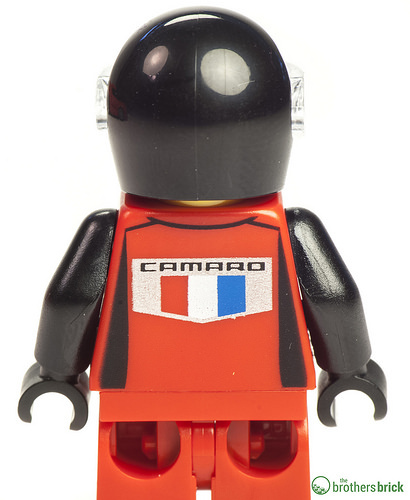 He’s dressed in red livery adorned with the Camaro logo front and back. 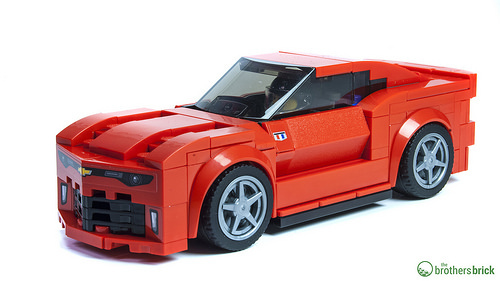 Unsurprisingly, the ’69 Camaro follows a construction style similar to its newer descendant. The only new molded element here is a 2×3 curved slope, identical to the one also found in the Mustang. The print on the 1×1 round tiles that form the hubcaps is new, though. 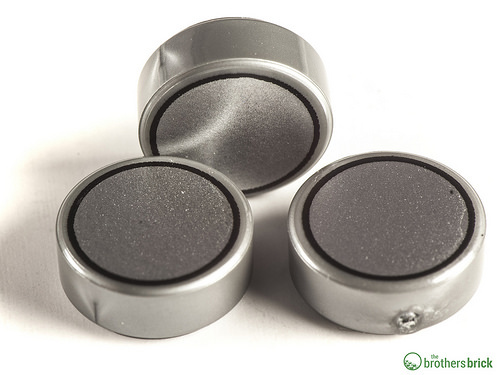 It’s just a simple silver disk, and makes the tiles look exactly like real watch batteries. While we’re looking at the tires, the ’69 Camaro obviously uses larger ones for the rear slicks, and they give the car a cool aggressive stance that helps define its Camaro-ness, even if they aren’t stock. 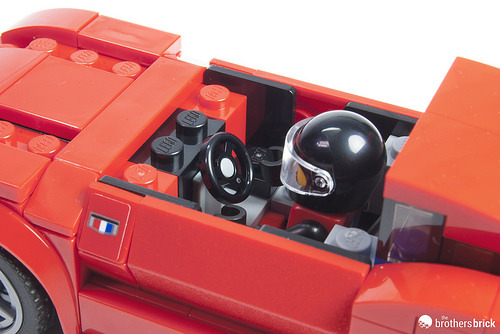 The car also comes with two engine blocks which can be easily swapped out thanks to a tile underneath. 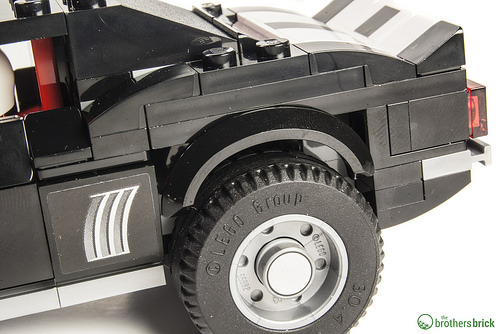 The paint scheme is black with two white stripes, but because LEGO hasn’t yet taken the leap to odd-width cars in the Speed Champions line, the center black portion is stickered. The rear fenders do expose an unsightly gap in bricks behind the fenders. 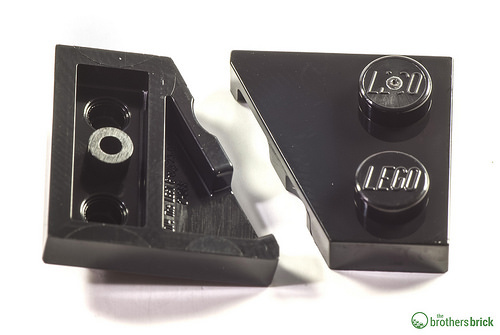 This would be such a trivial fix that I’m not sure why LEGO didn’t correct it—four 1×1 black plates should do the trick. 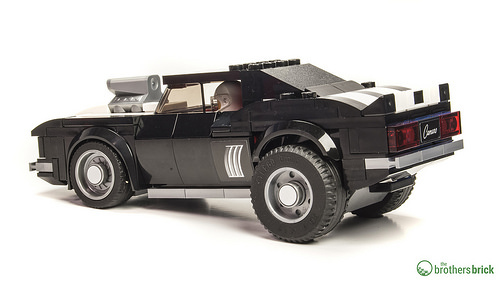 Nevertheless, I’m continually amazed at how recognizable LEGO’s designers have managed to make the Speed Champions vehicles while maintaining a relatively small scale and enough structural durability to allow heavy play. The ’69 Camaro is no exception, being a remarkably recognizable Chevy muscle car. 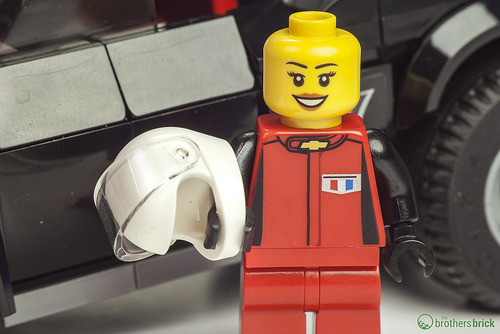 The old-school racer is operated by a white-helmeted female driver, who wears the same livery as the other driver. 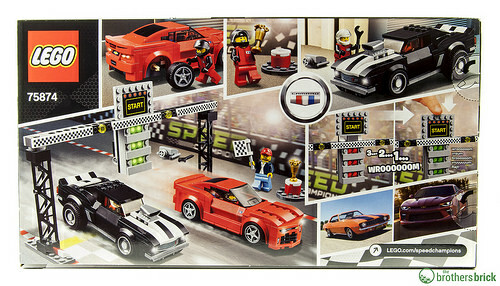 The set also comes with a timing gate to place over the racetrack. It features a clever little hand-operated signal system. In its default position, all the lights show red, but pushing the top down slightly causes the rubber Technic beam to function like a spring, flipping all the lights to green instantly. It’s a cool mechanic, and though it will probably see little use from adult fans, kids are sure to love it. I should note that I did not place large START sticker for the timing gate, which goes in the 4×6 grey tile plate over the signal. Standing by ready to begin the race is a flagman, who bears a checkered flag. I was sad to note that the flag is also stickered. 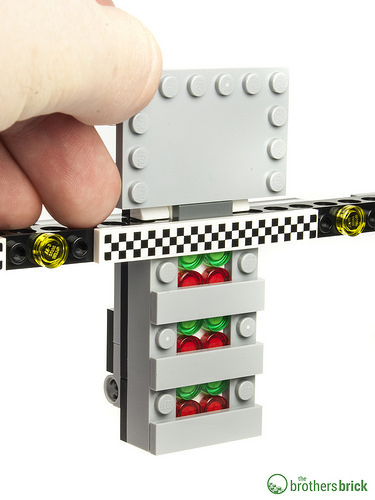 As recently as 2014 LEGO used a printed checkered flag, but over the past few years have been moving more and more away from printing elements such as this. The final piece of this set is the winner’s trophy. 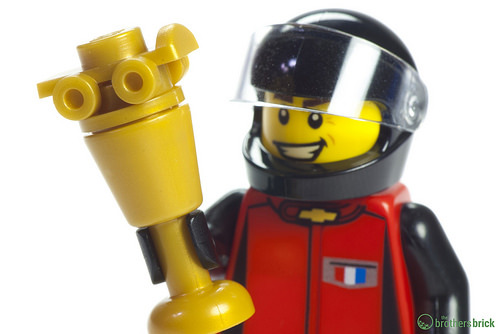 An exceedingly simple build, the trophy consists of only three elements, but it’s quite clever in using a pearl gold minifig roller skate as a tiny car atop the trophy. Nicely enough, the set includes a spare skate, so you can outfit some lucky minifig with golden skates if you can bear to disassemble your trophy. 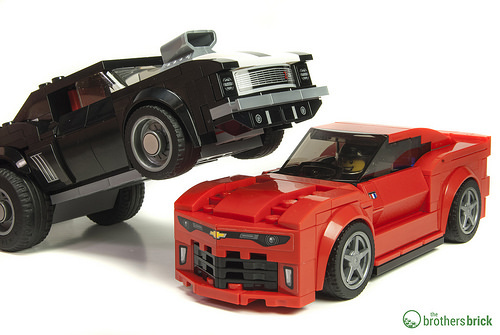 This is another solid entry to the Speed Champions line, and fans of Chevy’s boisterous muscle cars will enjoy seeing not one but two versions of the American classic in LEGO form. 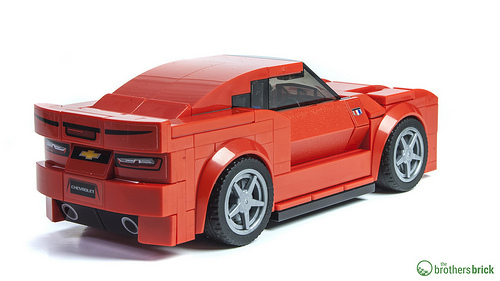 The extra bits in the set are simple, but well designed, and best of all they don’t add anything to price, which at $29.99 remains the same as two of the standalone Speed Champions car sets. This makes the set a steal with its 445 elements. That works out to a $0.067 per piece, or a third lower than a set this size would usually be priced. Maybe I’ll buy another copy, just to keep one around to display. 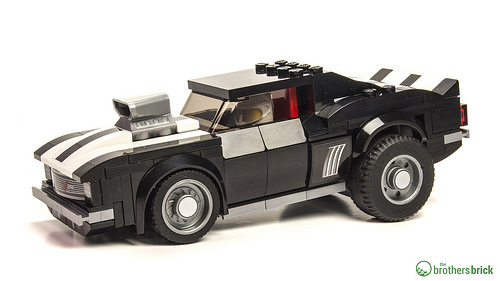 The 1969 Camaro looks like a great starting point for a Mad Max Interceptor!